Simple shapes of stones, shell and crystals, are joined with knotted silk and metal wire wrapping into versatile jewelry that is simply stunning! Made in California. 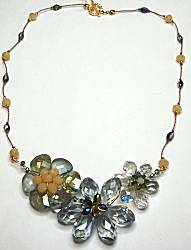 A trio of flowers formed in teardrop Swarovski crystals of different sizes and shapes, joined by golden wire to extend about 3 inches across front of neck, largest flower is 1-1/4 inches across. The crystal colors include clear with a bit of smoke, gray, lagoon greenish/gray and a hint of purple. Suspended from tan silk cord with smaller crystals knotted along the way. Golden toggle clasp, 18 inches long. 2-3/8 inches long including earwire, 3/4 inch across. Golden wire wraps the teardrop crystals together for a flower and drop, the crystal color is a lagoon green with a subdued gray tone, flashes from fire-polished surfaces. 2 inches long including earwire, 9/16 inch across. Golden wire wraps the crystals together for a flower and drop, the crystal colors are light greens like herbs or celery. A trio of flower motifs in teardrop crystals of various sizes and shapes, are formed with golden wire. The crystal colors are subtle clear with smoke hint, bluish-gray and gray with fire-polished and AB surface hints. Accents in a bit of green and midnight, along with the opaque tan color. Tan silk cord is knotted around single crystals toward the back. Golden toggle clasp, 18 inches long. 2-1/4 inches long including earwire, 1/2 inch across. Golden wire wraps the crystals together into a delicate sparkling drop. The crystal colors include an icy gray, and green with fire-polished surfaces that glint into gray, gold and pink. 3 inches long including earwire, 1 inch across. Golden wire wraps the pointed oval crystals together for a flower and drop, the crystal color is icy gray with fire-polished surfaces, a bit of purple at the center and above. 36 inches long with golden toggle clasp, you can wear long or doubled (as shown). Brown silk cord is knotted around gemstones, crystals and beads. You can see rich browns of jasper, mossy greens of another jasper, bright turquoise roses that are either glass or plastic, bronze dyed pearls, and sparkling crystals in bronze and fir green. Largest component is about 3/4 inch wide. Shimmering flat ovals of mother-of-pearl are bleached, then wrapped by golden wire into the flower petals surrounding lovely faceted crystals. The 1-1/2 inch flowers join to span the front 6 inches of neck, white silk cord is knotted around smaller stone, crystal and shell pieces to the back golden toggle clasp. 17 inches long. The colors are creamy ivory and ice white; pink, lavender and lime. 36 inches long, with silver metal toggle clasp, you can wear long or doubled (as shown). Purple silk cord is knotted around gemstones, crystals and beads. You can see luminous dyed purple shell, aqua blue, crystals in fire-polished play around aqua and purple. Largest component is about 1/2 inch wide. 36 inches long, with golden metal toggle clasp, you can wear long or doubled (as shown). Dark brown silk cord is knotted around gemstones, crystals and beads. You can see jasper in natural honey yellow, green adn brown tones, faceted citrines, crystals in tortoise and silver colors. Largest component is about 5/8 inch wide. Light brown silk cord is knotted around the elements creating a breezy style packed with interest! 17 inches long, golden toggle clasp. There are 2 golden wire-wrapped flowers, the largest is about 1-1/2 inches across. They are made with sparkling round cushion faceted crystals, and mother-of-pearl that has been dyed and striped with delicate black lines. Another pair of crystals offsets the flowers to the other side, and then all the shell and smaller crystals trail to the back. The colors are tigers-eye golden brown and champagne gold. 38 inches long, with silver metal toggle clasp, you can wear long or doubled (as shown). Light brown silk cord is knotted around gemstones, crystals and beads. You can see luminous shell dyed with black stripes in tigers eye golden brown, bronze freshwater pearls, art glass in swirling neutral colors, crystals sparkling in rootbeer brown. Largest component is about 5/8 inch wide. 36 inches long, with silver metal toggle clasp, you can wear long or doubled (as shown). Gray silk cord is knotted around gemstones, crystals and beads. You can see luminous shell dyed lavender purple, metallic plum dyed pearls, crystals in deep indigo flashing with purple, and amethyst color crystals. Largest component is about 5/8 inch wide. Dazzling both in sparkling crystals, as well as the substantial size and changes in shapes! Light brown silk cord is knotted around the crystals that lead to back golden toggle clasp. 18 inches long. 5 inches of the front is packed with design. There are 3 larger crystals in twisted flat round faceted shapes, with fire-polished faceted that work from fir green into golden topaz. There are dyed pearls in bronze and peacock gray. Smaller crystals in lemon-lime and tortoise brown. Largest crystal drops 1-1/4 inches. 1-3/4 inches long including goldfill earwire, a pair of faceted crystals are sparkling in rootbeer/topaz brown and lemon-bronze. Golden wire wraps the components together into this striking 1-1/2 inch wide earring, that is light and airy too! Round mother-of-pearl disks are dyed and striped with delicate black lines, then formed into a flower with crystal cluster center, a few crystals offset the design on the other side. 2-1/4 inches long on goldfill earwire. The colors are navy blue, midnight teal and charcoal gray. Navy blue silk cord is knotted around the elements creating a breezy style packed with interest! 17 inches long, golden toggle clasp. There are 2 golden wire-wrapped flowers, the largest is about 1-1/2 inches across. They are made with sparkling round cushion faceted crystals, and mother-of-pearl that has been dyed and striped with delicate black lines. Another pair of crystals offsets the flowers to the other side, and then all the shell and smaller crystals trail to the back. The colors are navy blue and charcoal gray. Shimmering flat ovals of mother-of-pearl are dyed, then wrapped by golden wire into the flower petals surrounding lovely faceted crystals. The 1-1/2 inch flowers join to span the front 6 inches of neck, lavender silk cord is knotted around smaller crystal and shell pieces to the back golden toggle clasp. 17 inches long. The colors are lavender and purple; lime and champagne. 1-1/4 x 1 inch oval of mother-of-pearl is dyed luminous lavender purple, wire-wrapped fire-polished amethyst purple crystals form a flower motif in the center. 2-1/8 inches long on goldfill earwire. Dark brown silk cord is knotted around the elements creating a breezy style packed with interest! 17 inches long, golden toggle clasp. There are 2 golden wire-wrapped flowers, the largest is about 1-1/2 inches across. They are made with sparkling round cushion faceted crystals, and mother-of-pearl that has been dyed and striped with delicate black lines. Another pair of crystals offsets the flowers to the other side, and then all the shell and smaller crystals trail to the back. The colors are bright cherry red, garnet and bronze. Golden wire wraps the components together into this striking 1-1/2 inch wide earring, that is light and airy too! Round mother-of-pearl disks are dyed and striped with delicate black lines, then formed into a flower with crystal cluster center, a few crystals offset the design on the other side. 2-1/4 inches long on goldfill earwire. The colors are bright cherry red and bronze. 1-1/4 x 1 inch oval of mother-of-pearl is dyed a luminous bronze, wire-wrapped bronze crystals form a flower motif in the center. 2-1/8 inches long on goldfill earwire. Shimmering flat ovals of mother-of-pearl are dyed, then wrapped by golden wire into the flower petals surrounding lovely faceted crystals. 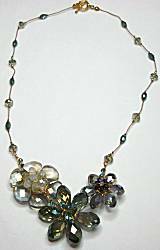 The 1-1/2 inch flowers join to span the front 6 inches of neck, light brown silk cord is knotted around smaller crystal and shell pieces to the back golden toggle clasp. 17 inches long. The colors are tigers-eye golden brown and light smoke; lavender, lime and champagne. 38 inches long, with gold metal toggle clasp, you can wear long or doubled (as shown). Dark brown silk cord is knotted around gemstones, crystals and beads. You can see jasper ovals in sunset earth colors and fascinating natural patterns, oval amethyst crystals, midnight blue and violet crystals with firepolish to glint. Largest component is about 5/8 inch wide. Read about what others think of Sun Designs jewelry! Instead of reviews for a specific product, this is a place to share about the designer line in general.